1. 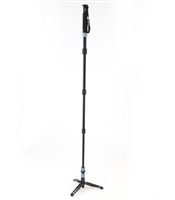 Three sturdy fold-down support feet provide additional stability and flexibility*. Removable for use as a standard monopod. 8. Rubber foot for use on wooden, stone surfaces. Replace with spike for use outdoors in grass and dirt. 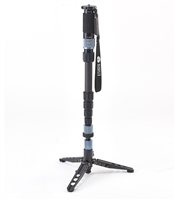 Included in the box: Photo/video monopod, rubber foot, stainless steel spike, wrist strap, custom padded case, shoulder strap, tools, instruction manual, warranty card.